Even if you don't personally have a taste for the famous fire-pit dancing at the Flaming Nix, you have to admit it adds a certain cachet to having a room there. Not to mention an unusual fragrance. Flaming Nix Deluxe Garret is a player apartment in Mournhold. To purchase this apartment with Gold, you need to complete A Friend In Need. 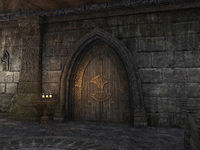 This apartment was added to the game world in Update 12, replacing an inaccessible room in the tavern. Homeowner 5 Obtain and enter any of the following staple homes. Freeholder 10 Obtain and enter three of the following staple homes. Citizen 15 Obtain and enter five of the following staple homes. This page was last modified on 19 November 2018, at 07:16.